My 6 year old daughter had been begging all last week to bake something. She wanted to make some apple cupcakes. She took out a page of her recipe book and wrote down all the ingredients and handed it to me. When I asked her how much of each ingredient, she didn't have an answer. So I had to explain to her that recipes are not just about ingredients, they are all about measurements. So she started pulling out her measuring spoons and put one next to each ingredient. It was really cute, but then I had to explain to her that when you don't know what you are doing, it is best to start with a base recipe and adapt it from there. I found a recipe on the Food Network website for Apple Coffee Cake with Crumble Topping that sounded good. It was by Emeril Lagasse, you can't go wrong with any of his recipes. I didn't want a heavy cupcake and I wasn't in the mood for frosting. So I convinced my daughter we should try to make this recipe as muffins in cute cupcake liners. She was happy. I had most of the ingredients except for sour cream, but I had some Vanilla Chobani yogurt on hand. I also wanted to add a touch of maple, so I replaced some of the sugar for maple syrup. Just look at those chunks of apples sitting in that fluffy maple cloud. Don't you just want to dive right in? Here my assistant in sprinkling the crumble on top of the muffins before putting then in the oven. We did not go overboard on the crumble, just a little to give the muffins a little crunch. I used some maple butter that I had made before to make the crumble and keep with the maple flavor. The end result was a light, airy muffin. 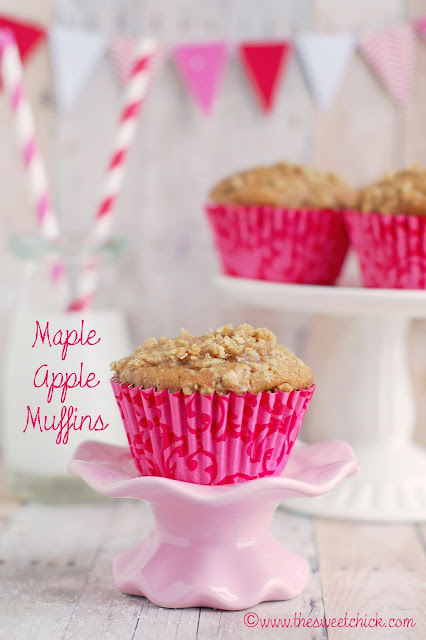 Not to sweet, but full of maple and apple flavor with a slightly crunchy topping. Perfect to go with coffee, tea, or a glass of milk. I'd share, but sadly they are all gone. Preheat oven to 350º F. Fill muffin tins with liners. In a stand mixer, cream together the brown sugar and the butter. Then add the eggs and mix on low until well blended. In a large bowl sift together flours, baking soda, cinnamon and salt. Then slowly add the dry ingredients to the butter mixture while mixing on low. Add yogurt and vanilla extract. Then add maple syrup and continue to mix on low until all ingredients are well incorporated. Lastly, add the chopped apples and mix until apple pieces are well distributed. Evenly distribute the batter into the muffin liners. Then make the topping. In a small bowl mix together the sugar, flour, oatmeal, and cinnamon. Blend with a fork, making sure there are no lumps. Melt the butter in a glass container in the microwave for about 20 seconds. Then pour over the dry mixture. Blend with a fork until mixture becomes crumbly. Evenly distribute the crumble mixture over muffin batter. Then place muffin tins in the oven and bake at 350º for 15-20 minutes, or until toothpick inserted in center comes out dry. Thanks! Yep, scrapbook paper I bought at Joann's. That's the only place I found it so far. I have 4 sheets in case I get one dirty. I've been thinking of incorporating some of the 1000's of sheets of scrapbook paper too ('cause it's not getting used for scrapbooking!). Your pics are amazing! What kind of camera are you using as I shopping for a new DSLR. Time to get rid of my point & shoot! Yeah, I am far behind in my scrapbooking too. My camera is an old Nikon D50. I use a 50mm 1:1.8 lens for food photos. I bought it 7 years ago and it still takes great pictures. My next upgrade will probably be a D90. Mmmmm! Mmmmmm! Mmmmm! These look yummy! What a great combo. Thanks so much for sharing on Two Cup Tuesday at Pint Sized Baker. Please stop by tonight and link up again! Thanks Karyn, I will try to stop again tonight or tomorrow. Your welcome Jutta. I am trying to keep a schedule so I can join all the link parties, but sometimes I run out of time to get to everyone every week.